Live by Night is a 2016 American crime drama film written, directed, produced by and starring Ben Affleck. Based on the 2012 novel of the same name by Dennis Lehane, the film follows an Ybor City bootlegger (Affleck) who becomes a notorious gangster. The film also stars Elle Fanning, Brendan Gleeson, Chris Messina, Sienna Miller, Zoe Saldana and Chris Cooper. Produced by Warner Bros., the film premiered in New York City on December 13, 2016. It began a limited release in the United States on December 25, 2016, before going wide on January 13, 2017. It received mixed reviews and was a box office bomb, grossing $22 million against its net budget of $65 million. The film lost around $75 million, according to insiders and rival studio executives. In 1926, Joe Coughlin, a World War I veteran of Irish descent and the prodigal son of Boston police captain Thomas Coughlin, falls in love with Emma Gould, the mistress of notorious gangster Albert White, the boss of the Irish Gang of Boston. Thomas objects to the relationship and advises Joe against his criminal activities, warning him that his wrongdoing will catch up with him eventually. White's rival, Italian Mafia boss Maso Pescatore, finds out about their affair and blackmails Joe to kill White. Joe refuses but he and Emma decide to flee to California. To fund the trip, Joe commits a bank heist with his partner Dion Bartolo, during which three police officers are killed in an ensuing chase. When Joe tries to leave with Emma anyway, she lures him into a trap set by White. Joe is brutally beaten by White and his men and nearly killed before the police arrive and arrest Joe for the policemen's murders. Thomas tells Joe that Emma drowned while being pursued by police. He also blackmails Chief Inspector Calvin Bondurant to ensure that Joe is sent to prison on a relatively minor charge rather than murder. Two weeks before Joe's release, Thomas dies of a heart attack. Wanting revenge against White, Joe volunteers his services to Pescatore and is recruited as an enforcer for Pescatore's rum empire in Ybor City in Tampa, Florida, which is under attack by White. Joe reconnects with Dion and together they protect Pescatore's business in the area and receive orders to bring gambling and drugs into Tampa. Joe also develops a relationship with Graciela Corrales, the sister of a local Cuban businessman, and they are soon married. Joe befriends Sheriff Irving Figgis. Irving's daughter Loretta heads to Hollywood to become an actress but instead becomes a heroin-addicted prostitute. Irving's brother-in-law, R. D. Pruitt, a member of the local chapter of the Ku Klux Klan, starts bombing Joe's clubs and killing his men. Joe promises Irving to help get Loretta off drugs and back to Ybor City in exchange for his betrayal of Pruitt. Joe kills Pruitt and, in the ensuing mob war with the Klan, he and his men beat or kill enough Klansmen to weaken the group's standing in Florida. Recognizing that Prohibition will eventually come to an end and unwilling to follow Pescatore's orders to invest in narcotics, Joe focuses on building a casino near Sarasota. He intends to persuade the government to legalize gambling, but Loretta, who has become a devout Christian under her father's strict and punishing discipline, begins preaching that alcohol and gambling are against God's word. Her ministry is popular enough that the government decides not to legalize gambling. Joe recognizes that Pescatore will be enraged, particularly since Joe still refuses to invest in narcotics. During a private meeting in a restaurant, Loretta confides to Joe that she does not truly believe in God and her sins cannot be forgiven. The next day, Joe is despondent to learn that Loretta committed suicide. While visiting his brother-in-law, an amateur photographer, Joe finds a recent picture of Emma, whom he believed to be dead. He decides to pursue her in Miami, but only after informing Graciela first, much to Dion's dismay. Pescatore forms an alliance with White and lures Joe into a meeting at a hotel, intending to have him killed and replaced by White in retaliation for Joe's recent failures. Anticipating Pescatore's betrayal, Joe distracts White by showing him Emma's picture, as White also believed her to be dead. Dion and his men ambush Pescatore's men through a series of underground tunnels that Joe used to move rum. Joe kills White, Pescatore and Pescatore's son, Digger. Joe names Dion as his successor before locating Emma at a brothel in Florida. She relates how she faked her death to escape from White and enjoys her newfound freedom, and claims she never reciprocated Joe's love for her. Joe and Graciela move to Miami, where they have a son and spend their days building houses for the impoverished. Driven insane by Loretta's death, Figgis tracks them down and shoots up their house, killing Graciela before being fatally shot by Joe. Joe arranges for Graciela to be buried in her homeland in Cuba and spends the rest of his days dedicated to charity and to raising Tommy, who soon voices his desire to become a police officer. Warner Bros. acquired the rights to Dennis Lehane's Live by Night in April 2012, with the intention of developing the project as a starring vehicle for Leonardo DiCaprio, through his Appian Way Productions. In October 2012, it was announced that Ben Affleck would direct, write, and star in the film; he and Jennifer Todd would produce through their production company Pearl Street Films, along with Appian Way's DiCaprio and Jennifer Davisson Killoran. In the summer of 2013, Affleck and film crew members visited Tampa, Florida, and Lawrence, Massachusetts, to scout for locations. In August 2013, it was reported that production would be pushed back from the fall of 2013 to the fall of 2014, due to Affleck's acting commitments in Gone Girl (2014) and Batman v Superman: Dawn of Justice (2016). He visited various locations in Brunswick, Georgia in the summer of 2014. Affleck stated in a September 2014 interview that the film had been green-lit: "It's supposed to start shooting in July  and I'll start prepping in March. We got a budget, we got locations." On September 4, 2014, Sienna Miller, Zoe Saldana and Elle Fanning joined the cast of the film. Affleck visited Brunswick, Georgia, again in February 2015. On July 9, 2015, Warner Bros.' decision to green-light the film was officially announced. Miller, Saldana and Fanning were all still attached to the project. From August to December 2015, other cast members were gradually revealed, including Chris Messina, Chris Cooper, Miguel, Max Casella, Scott Eastwood (who did not appear in the finished film), Brendan Gleeson, Anthony Michael Hall, and Titus Welliver. Principal photography began on October 28, 2015, in coastal Georgia. Exterior scenes were filmed in Brunswick, at Affleck's private property on Hampton Island near Riceboro, on Tybee Island, in Savannah, and at Fort Pulaski National Monument. Tampa's film commissioner said tax rebates in both Georgia and Affleck's home on Hampton Island, a 45-minute drive from Brunswick, had led the filmmakers to choose the state instead of Florida. Filming took place in Lawrence, North Andover, and Boston's North End. From December 2015 to February 2016, filming took place in Los Angeles, California. Scenes were shot at the Millennium Biltmore Hotel in Pasadena, and in Wilmington. Cinematographer Robert Richardson used both the Arri Alexa 65 and vintage 65 lenses from Panavision. William Goldenberg signed on as the film's editor; he had previously worked with Affleck on Gone Baby Gone and Argo. Harry Gregson-Williams, who previously worked with Affleck on Gone Baby Gone and The Town, composed the score. In March 2016, Affleck remarked: "Editing is a strange process. It's a lot of ups and downs, but overall, the movie has amazing performances. I just got so lucky with the cast. They're incredible ... The hardest part about the process now is trying to find stuff to cut out because I don't want the movie to be too long." In November 2013, Warner Bros. scheduled the film for a Christmas 2015 release date. In May 2014, the release date was moved to October 7, 2016 and, in August 2015, it was pushed to an unknown release date in 2017. In March 2016, Warner Bros. stated that the film would be released on October 20, 2017. In June 2016, however, the release date was changed to January 13, 2017. In October 2016, the film was pushed up to a limited release on December 25, 2016, before opening wide on January 13. Live by Night grossed $10.4 million in the United States and Canada and $12.3 million in other territories for a worldwide total of $22.7 million, against a net production budget of $65 million. Over its first two days of release, the film grossed $49,000 (including $33,000 on its opening day) for a four-theater average of $8,250, finishing 34th at the box office. In North America, the film had its expansion alongside new openers Monster Trucks, The Bye Bye Man and Sleepless, as well as the wide releases of Silence and Patriots Day. It was expected to gross around $10 million from 2,822 theaters in its four-day MLK opening weekend. It ended up debuting to $5.1 million (a four-day total of $6.2 million), finishing 11th at the box office. Deadline Hollywood attributed the film's poor opening to its crowded release weekend, as well as lack of critical praise and award buzz. 54% of its opening weekend attendance was male, while 88% was over the age of 25. The film grossed $1.8 million in its second weekend of wide release (a drop of 64.8%), falling to 15th at the box office. In its third week of wide release the film was pulled from 94.1% of theaters (2,822 to 163) and grossed just $101,028, marking at the time the largest third-week theater drop in history (besting the 2,523 theater decrease set by Meet Dave in 2008); the record was overtaken by The Darkest Minds in August 2018. Due to its poor performance, the film is expected to lose Warner Bros. around $75 million. On review aggregation website Rotten Tomatoes, the film has an approval rating of 35% based on 215 reviews, and an average rating of 5.3/10. The website's critical consensus reads, "Live by Night boasts visual style and an impressive cast, but they're lost in a would-be crime saga that finds producer, director, and star Ben Affleck revisiting familiar themes to diminishing effect." On Metacritic, which assigns a normalized rating, the film has a score of 49 out of 100, based on 43 critics, indicating "mixed or average reviews". Audiences surveyed by CinemaScore gave the film an average grade of "B" on an A+ to F scale. Mike Ryan of Uproxx gave the film a mixed review, and noted that it felt rushed to completion, saying, "I am a fan of the movies Ben Affleck has directed. That's why Live by Night is such a disappointment. I was actively looking forward to it. And I would have given it any benefit of the doubt, but this movie just isn't there. It feels like a rushed project that Affleck had to get out of the way before he plays Batman again." Owen Gleiberman of Variety also gave the film a mixed review, writing: "It's like seeing the ghost of a terrific movie: All the pieces are in place, yet as you're watching it (or thinking back on it afterwards), there doesn't seem to be quite enough there." David Rooney of The Hollywood Reporter wrote, "Live by Night is solid enough entertainment, but it lacks the nasty edge or narrative muscularity to make it memorable." Eric Kohn of IndieWire gave the film a C, writing: "Ultimately, Live by Night doesn't suggest Affleck's lost his groove so much as that his groove has its limits. Saddled with derivative material, he can't seem to find a fresh approach." ^ "Live by Night (15)". British Board of Film Classification. November 28, 2016. Retrieved November 28, 2016. ^ Sperling, Nicole (November 2, 2016). "See an exclusive new look at Ben Affleck's Argo follow-up Live By Night". Entertainment Weekly. Retrieved November 2, 2016. 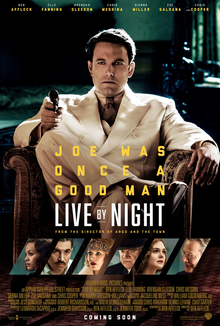 ^ a b "Live By Night (2016)". Box Office Mojo. Retrieved August 5, 2017. ^ a b Lincoln, Ross (June 17, 2016). "Warner Bros Pushes 'Lego Movie 2' Release To 2019". Deadline Hollywood. Retrieved June 17, 2016. ^ a b Lang, Brent. "Ben Affleck's 'Live by Night' Flop Results in $75 Million Loss (EXCLUSIVE)". Variety. Retrieved July 28, 2017. ^ Jaugernauth, Kevin (April 13, 2012). "Leonardo DiCaprio Will 'Live By Night' In Dennis Lehane Adaptation For Warner Bros". Indiewire. Retrieved August 17, 2016. ^ "Ben Affleck And Warner Bros Set Next Film: Dennis Lehane Crime Novel 'Live By Night'". Deadline Hollywood. Retrieved May 7, 2013. ^ "Jersey Boys' And Ben Affleck's 'Live By Night' Get Release Dates". Deadline Hollywood. November 5, 2013. Retrieved April 8, 2014. ^ Waxler, Erik (May 23, 2013). "Affleck visits Ybor City, but will he film there?". ABC Action News. Retrieved September 27, 2016. ^ "Ybor City passed up for fake set in Ben Affleck movie". ABC Action News. September 29, 2015. Retrieved September 26, 2016. ^ Annear, Steve (June 4, 2013). "Ben Affleck Has Been Scouting Movie Locations in Massachusetts". Boston Magazine. Retrieved September 27, 2016. ^ Messenger, Brian (May 25, 2013). "Ben Affleck scouts filming locations in downtown Lawrence". Eagle Tribune. Retrieved September 27, 2016. ^ Fleming, Mike, Jr. (July 11, 2013). "Ben Affleck To Star In David Fincher's 'Gone Girl' For Fox/New Regency Before Directing Warner Bros' 'Live By Night'". Deadline Hollywood. Retrieved September 27, 2016. ^ Jagernauth, Kevin (August 25, 2013). "Ben Affleck Signed For Multiple Films As Batman & Will Help "Create" The Character; 'Live By Night' To Shoot In 2014". Indiewire.com. Retrieved September 27, 2016. ^ Jagernauth, Kevin (November 5, 2013). "Ben Affleck's 'Live By Night' Set For Xmas 2015 Release, Filming To Start September 2014". Indiewire.com. Retrieved September 27, 2016. ^ Shanahan, Mark (September 26, 2014). "Ben Affleck back in front of camera with 'Gone Girl'". Boston Globe. Retrieved September 27, 2016. ^ Buckley, Cara (October 3, 2014). "An Actor-Director Above Suspicion". The New York Times. Retrieved September 27, 2016. ^ Fleming, Mike, Jr. (September 4, 2014). "Sienna Miller, Zoe Saldana & Elle Fanning Join Ben Affleck's 'Live By Night'". Deadline Hollywood. Retrieved September 5, 2014. ^ Hall, Anna (February 11, 2015). "Ben Affleck scouts movie locations in Brunswick". The Brunswick News. Retrieved September 27, 2016. ^ a b Kroll, Justin (July 9, 2015). "Ben Affleck's 'Live by Night' Gets Greenlight, November Start Date (EXCLUSIVE)". variety.com. Retrieved July 9, 2015. ^ Jaafar, Ali (August 28, 2015). "Chris Messina In Negotiations To Join Ben Affleck's 'Live By Night'". Deadline Hollywood. Retrieved August 31, 2015. ^ Kroll, Justin (October 20, 2015). "Chris Cooper Joins Ben Affleck's 'Live By Night' (EXCLUSIVE)". Variety. Retrieved September 27, 2016. ^ Hipes, Patrick (November 2, 2015). "R&B Star Miguel Joins Cast Of Ben Affleck's 'Live By Night'". Deadline Hollywood. Retrieved November 11, 2015. ^ Pedersen, Erik (November 5, 2015). "Max Casella Mobs Up For 'Live By Night'; Carice Van Houten Finds 'The Parts You Lose'". Deadline Hollywood. Retrieved November 9, 2015. ^ Geier, Thom (November 13, 2015). "Scott Eastwood to Play Ben Affleck's Brother in WB's 'Live By Night' (Exclusive)". The Wrap. Retrieved September 27, 2016. ^ Fleming, Mike, Jr. (November 18, 2015). "Brendan Gleeson Joins Ben Affleck's 'Live By Night'". Deadline Hollywood. Retrieved September 27, 2016. ^ Pedersen, Erik (November 23, 2015). "Kurt Fuller Has Appointment With 'Phil'; Anthony Michael Hall Joins 'Live By Night'". Deadline Hollywood. Retrieved December 7, 2015. ^ Geier, Thom (December 1, 2015). "Ben Affleck Casts Titus Welliver as Mob Boss in WB's 'Live By Night' (Exclusive)". The Wrap. Retrieved September 27, 2016. ^ Lesnick, Silas (October 28, 2015). "Live By Night: Ben Affleck Shares the First Shot". comingsoon.net. Retrieved October 29, 2015. ^ Miller, Michael (November 12, 2015). "Ben Affleck Working 'Every Possible Hour of the Day' on First Film Since Split with Jennifer Garner: Sources". People Magazine. Retrieved September 27, 2016. ^ Morning News, Savanna (November 10, 2015). "Ben Affleck, 'Live By Night' crew film on Tybee Island". Savannah Now. Retrieved September 27, 2016. ^ Morning News, Savanna (November 11, 2015). "Ben Affleck, 'Live By Night' continue filming along Georgia coast". Savanna Now. Retrieved September 27, 2016. ^ Rooker, Marla (November 1, 2015). "'Live by Night' filming at Fort Pulaski Bridge". WTOC. Retrieved September 27, 2016. ^ Guzzo, Paul (September 29, 2015). "Fake Ybor City rising in Georgia for Affleck's Prohibition-era film". TBO.com. Retrieved September 27, 2016. ^ Chen, Nancy (November 13, 2015). "Filming for new Ben Affleck movie begins in Lawrence". whdh.com. Archived from the original on November 14, 2015. Retrieved November 14, 2015. ^ Yearout, Kacie. "Ben Affleck movie takes over North End". MyFoxBoston. Retrieved November 21, 2015. ^ Shanahan, Mark (November 13, 2015). "Ben Affleck starts work in Lawrence on 'Live by Night'". The Boston Globe. Retrieved September 27, 2016. ^ a b "Ben Affleck debuts new 'Batman V Superman' trailer as 'Live By Night' filming moves to L.A." onlocationvacations.com. December 3, 2015. Retrieved December 8, 2015. ^ J, Jenna (September 8, 2016). "LIVE BY NIGHT (2017) FILMING LOCATIONS". OnSet-Hollywood.com. Retrieved September 27, 2016. ^ Grobaty, Tim (February 7, 2016). "Gunshots at El Dorado! Relax, it's just a movie". Long Beach Press Telegram. Retrieved September 27, 2016. ^ Grobar, Matthew (February 15, 2016). "'Hateful Eight' DP Robert Richardson On The Tarantino-Disney Debacle: "It Hurt Quentin, Emotionally" – AwardsLine". Deadline Hollywood. Retrieved September 27, 2016. ^ Cinema, Digital (January 17, 2016). "Digital Cinema Show — Episode II — Interview with Robert Richardson, ASC Digital Cinema". YouTube.com. Retrieved September 27, 2016. ^ Middelton, Keri (November 14, 2014). "Filmmaking: Don't Wait. Just Edit". Avid Blogs. Retrieved September 26, 2016. ^ Giardina, Carolyn (December 30, 2015). "'Concussion' Editor Talks About Balancing Artistic License, Lawyers and the NFL (Q&A)". The Hollywood Reporter. Retrieved September 26, 2016. ^ "Henry Gregson-Williams to Score 'Ailen: Covenant & Ben Affleck's Live By Night". Film Music Reporter. February 17, 2016. Retrieved September 26, 2016. ^ V. Nepales, Ruben (March 27, 2016). "Ben Affleck on Jennifer Garner as mom, project with Matt Damon". Inquirer.net. Retrieved September 26, 2016. ^ "Ben Affleck's 'Live by Night' Release Date Pushed Back". variety.com. August 7, 2015. Retrieved April 2, 2016. ^ McNary, Dave (March 22, 2016). "Ben Affleck's Crime Drama 'Live by Night,' 3 More Warner Bros. Films Dated for 2017". Variety. Retrieved March 22, 2016. ^ Chitwood, Adam (March 22, 2016). "Ben Affleck's 'Live by Night' Gets Oscar-Friendly 2017 Release Date". Collider.com. Retrieved April 2, 2016. ^ McClintock, Pamela (October 4, 2016). "Ben Affleck's 'Live by Night' Lands New December Release Date". The Hollywood Reporter. Retrieved October 4, 2016. ^ a b "With 'Fences,' 'La La Land' Enter Top 10 As 'Rogue One' & 'Sing' Rule Holiday – Monday AM Update". Deadline Hollywood. ^ "Ben Affleck's 'Batman' Can't Save DC Films From Itself". Forbes. ^ "Live By Night (2016)". Rotten Tomatoes. Fandango Media. Retrieved April 13, 2018. ^ "Live By Night Reviews". Metacritic. CBS Interactive. Retrieved January 19, 2017. ^ "Ben Affleck's 'Live By Night' Should Be Eight Hours Longer". Uproxx. December 21, 2016. Retrieved December 21, 2016. ^ Gleiberman, Owen (December 21, 2016). "Film Review: Ben Affleck Directs and Stars in 'Live by Night'". Variety. Penske Business Media. Retrieved December 21, 2016. ^ Rooney, David (December 21, 2016). "'Live by Night' Review". The Hollywood Reporter. Prometheus Global Media. Retrieved December 21, 2016. ^ Kohn, Eric (December 21, 2016). "'Live By Night' Review: Ben Affleck's Directing Skills Show Their Limits". IndieWire. Penske Business Media. Retrieved December 21, 2016. This page was last edited on 28 December 2018, at 07:34 (UTC).